Pastagate: Quebec Agency Criticized For Targeting Foreign Words On Menus : The Two-Way A government agency in Quebec, Canada, has come under intense criticism after attempting to get pasta stricken from a restaurant's menu. The move had nothing to do with the food: Officials said Italian words such as pasta, calamari, and antipasto should be replaced with French words. In Quebec, a restaurant's use of the word "pasta" on its menu sparked a government agency into action. Officials who enforce rules that guard French as the official language now say "exotic" words can be allowed in some cases. A government agency in Quebec, Canada, has come under intense criticism after attempting to get pasta stricken from a restaurant's menu. The move had nothing to do with the food: Officials said Italian words such as pasta, calamari, and antipasto should be replaced with French words to conform with the law. After Quebec's office that enforces the predominance of the French language sent an official notice of infractions against Quebec's Language Charter to the Buonanotte restaurant earlier this month, co-owner Massimo Lecas posted a photo of his menu, with "pasta" and other offending words circled. The incident led to disbelief, outrage, a barrage of jokes, and eventually, a promise from Quebec Language Minister Diane De Courcy that her agency would review how it enforces a law requiring that no language takes precedence over French. In a separate incident, officials also asked a Montreal restaurant named Brit Chips to rename its signature dish — fish and chips — poisson frit, et frites. For its part, the Quebec government has admitted that its agents had acted with an "excess of zeal," although it maintained that they were responding to complaints from citizens. 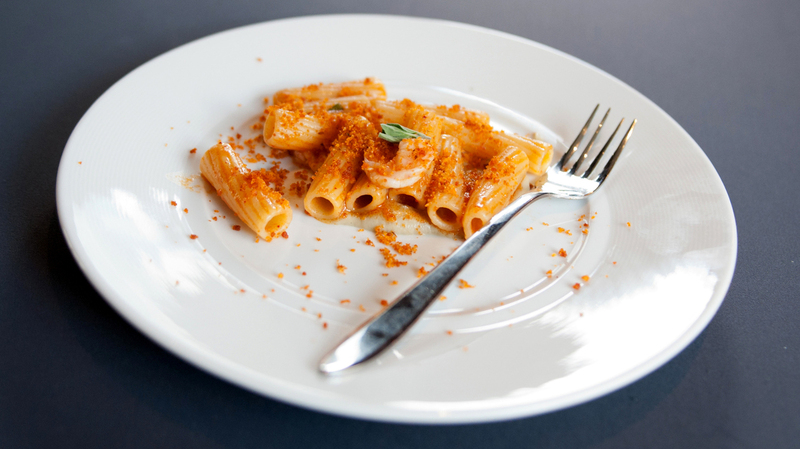 The agency now says Italian words such as "pasta" can be allowed on menus. "If it's only the name of the dish, if it's an exotic name in the language of origin, that wouldn't be a problem," OQLF spokesman Martin Bergeron told the CBC. That could open the possibility of exceptions for some dishes, the report concludes, provided they have exotic names such as "fish and chips." The flap sparked a flurry of news stories. And on Twitter, the #pastagate hashtag attracted everything from serious debate to jokes about the language police "gnocching" at people's doors. To many of his supporters, Lecas tweeted a standard response: "Grazie...oooops MERCI!" Monday, Lecas said that he received an official letter — in French, of course — notifying him that the inquiry into his restaurant's menu was now closed. Despite the agency's retreat from its initial position, the publicity generated by "pastagate" led other restaurateurs to come out with their own stories of the government's efforts to cleanse them of languages other than French. At Brasserie Holder, owner Maurice Holder tells the CBC that the Quebec agency faulted a grocery list, written on a kitchen chalkboard. While words such as salade, oeuf, and sucre passed muster, "steak" would need to be replaced by bifteck, he was told. "The restaurateur said he was also asked to cover up print on a hot water switch that read 'on/off,'" the CBC reports. "When a first layer of opaque tape failed to cover up the English words, Holder said he was told to add a second layer of tape." "I love Quebec... but it's not getting any easier," David McMillan, owner of Montreal's Joe Beef, tells National Post. McMillan speaks both English and French. "My wife is French, my business partner is French, my children go to French school, but I just get so sad and depressed and wonder, what's wrong with these people?" As Canada's CTV reports, an agency's analysis of media coverage of "pastagate" led to "60 times more coverage in news reports outside the province than a recent trip where Premier Pauline Marois tried to drum up foreign business for Quebec."